We often joke about Lycoris squamigera, those late summer flowering members of the Amaryllis family, Amaryllidaceae, because when they bloom, the leaves are long gone. 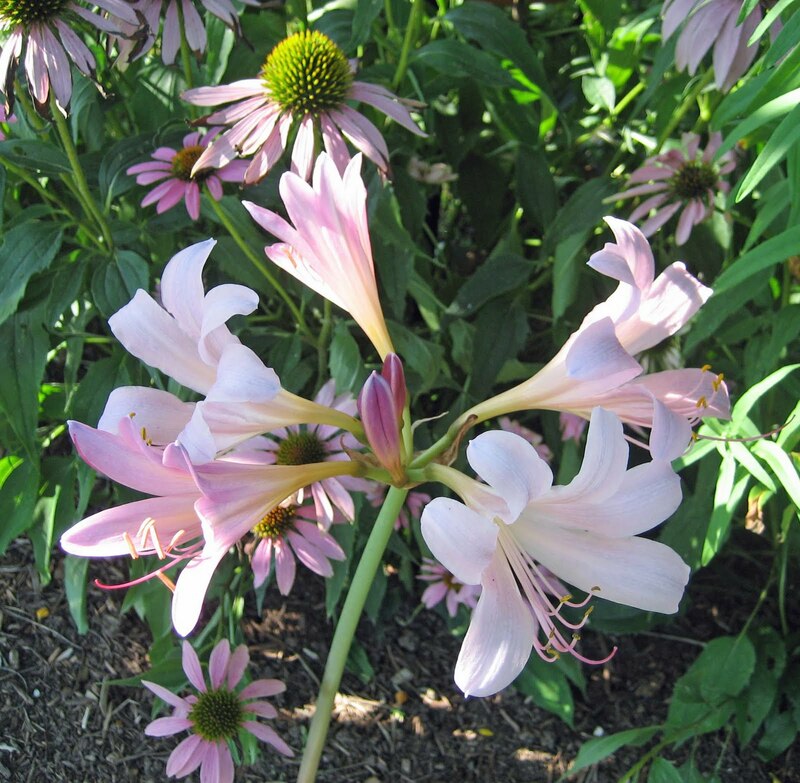 Some people refer to these plants as Surprise Lilies because "surprise", the blooms show up long after the foliage has died back. Others call them Resurrection Lilies because they die back and then the flowers shows up just when you've given up on them. Yet others call them Naked Ladies because when they bloom, they consist of the bloom stalk and the bloom, but no leaves. The more genteel gardeners among us, me included, generally spell this common name as "nekkid ladies" when writing about them online in an effort to discourage people who have no interest in gardening from visiting our blogs. We all want our blogs to be "search optimized" for the right reasons after all. If you have Lycoris squamigera in your garden, now is the time to see the "clothes" of the plant, as pictured above. 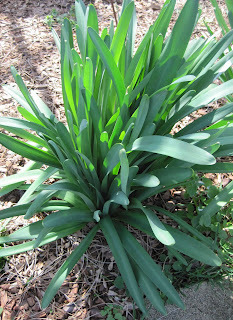 Some gardeners look at this foliage and think it is a clump of daffodils stubbornly refusing to flower. 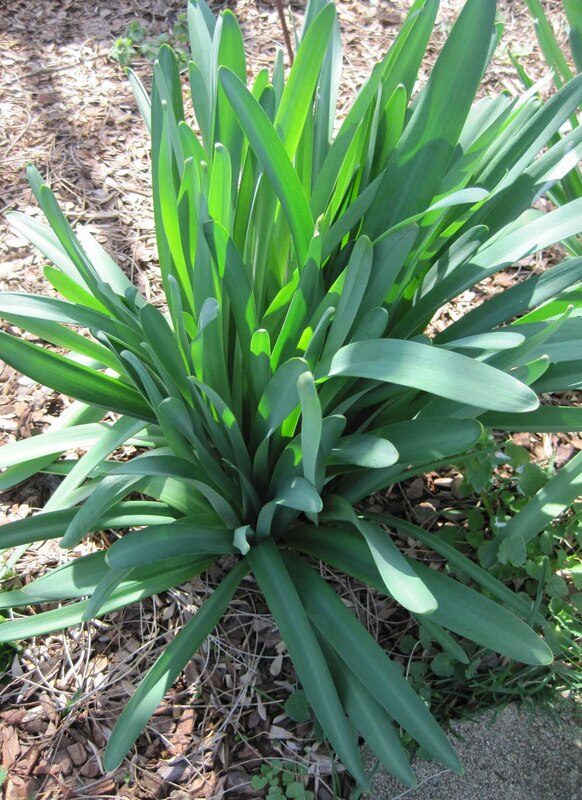 But if you look closely, you'll see that the Lycoris foliage is more rounded on the tips than daffodil foliage. And of course, you'll eventually notice daffodil blooms amongst the foliage of most daffodils. One question that gardeners often ask is when is the best time to move a Nekkid Lady. I've moved mine twice. The first time I moved them was when I dug them out of another garden in May when they had foliage. Within a few hours of digging them up I had replanted them in my garden. The second time I moved them was when I renovated the bed they were in. That time I dug up the bulbs in September, well after they had flowered. After both moves, they went on to flower the next year. As it turns out, though, neither May nor September is the best time to move these plants. The best time is June, right after the foliage has died back. Presumably the bulbs will be their biggest at that point. But even when moving Lycoris in June, some gardeners report that the plants sulk after the move and may not reappear for two years. My two moves of these plants demonstrate that there is an ideal time to move a plant, and then there is the time when you have to move a plant. So you just move it and hope for the best. The Nekkid Ladies in my garden need to be moved again for the new garden design. But this time I think I can wait until June when the foliage has died down. With this third move, I'll try my best to find them a good, long-term home so they can settle down and provide me with blooms in late summer, and leaves in spring, for many years to come. Lycoris blooms, perfectly matched to faded coneflowers. I saw those blooms in the wetlands on my property last year. I thought then of marking them but didn't. So by your picture I should be able to find the plant and move it to my garden. I'm not sure it will like that since my garden is on the top of the hill and the wetlands is at the bottom. I think I'll leave them and be surprised again by their blooms. Do surprise lilies ever get too crowded and have to be thinned? Mine have done beautifully for a nunber of years but last year, no flowers. Gorgeous leaves just no flowers when they were suppose to "surprise" me. This year, I have gorgeous leaves again and am wondering if I need to thin them. Thanks. Yes, the ladies have all been showing their spring frocks here. I have moved them at almost every time of year. They are such a resilient plant. They keep on growing. Your not-so-nekkid ladies are lush and green in their leafy frocks. I've seen lots of nekkid lady photos on blogs, but don't recall anyone showing us their clothes! They are hardy to what zone? I always thought of them as a plant that grows in the south, but you aren't all that southern. Very pretty flower with a funny name! I haven't had much luck with them here. I call them Surprise Lilies because it's a surprise if they bloom at all. To answer Kathy's question, they are hardy to Zone 5. These blooms were indeed a "surprise" to me one year when they appeared from no where. I'd lived in the house for 3 years and never seen them before...and certainly didn't plant them (or they wouldn't be a surprise). They're beautiful! Thanks for showing us what they look like with clothes. I've been wanting to get some of these for a while. Glad they survived both times you moved them. If the best time to move them is when they go dormant in between leafing out and flowering, then you must have to mark where they are in the bed (or have a real good memory). nice reading. Name made me smile. I am glad to find out when to move them. I just found them in my woods...I didn't plant them...in fact I've never had them. I guess it was a squirrel or something who planted them. Gotta love those ladies!! Nice pale pink color, too. My surprise lilies are up, too, and from the looks of the foliage, they may have multiplied this year. I like all the different names for them, but "surprise" seems to fit mine best, because the first year they came up, I thought they were Siberian iris:) I was definitely surprised when the blooms appeared later that summer! Hope you had a great Easter, Carol, and found a few leftover eggs while you were mowing! I had to move Iris corms this spring. It would be nice if they flowered, but I'm not expecting much. I've never seen Lycoris foliage, so thanks for the post. What intriguing lilies. Thanks for the info on them, and the pics! They're gorgeous. I'll have to hunt some down! I have to laugh because when we look at the search terms that bring people to our blog, phrases like "hot naked old ladies" and "mustache not growing" persist. Hi Carol, surprise lilies have made the move with me four times, dug at different time of the year. Three clumps still weren't blooming here after seven years, so I moved them last year after the foliage died back, and put them near the other three clumps that were thriving. I hope the newly-moved clumps bloom this year, but most likely it will take another year or two just like it has in the past. I love how the bloom stalks appear so suddenly, and bloom so quickly. I'm often surprised by their sudden appearance. My gardening notes indicate that I plan to plant these ladies in my garden, but so far that hasn't happened. Maybe this will be the year. Your information was helpful. The blooms are so, so pretty. Thank you so much for this post. My Grandmother has been offering me some of her ladies for years but I've never seen the blooms, only the foliage. Now, I think I will take them after all! I'd love to get one of the hurricane lilies in the genus too! The flowers of those are quite exotic looking. I took the plunge and moved the surprise lilies to a spot more visible. I hope they like it there. I was tempted to bring them up to my flower garden but since they were in the wetlands I left them in that zone just more visible - by my house number sign at the foot of my long driveway.